Enjoy all the comforts of home at Baymont Inn & Suites Ft. Leonard / Saint Robert hotel. Conveniently located off Interstate 44, our hotel is only two miles from Ft. Leonard Wood and close to the best area attractions, including 33 original miles of Historic Route 66, John Mahaffey Military Museums and Roubidoux Springs. We offer amenities you can count on for a restful stay. Start your day with free continental breakfast or work out in the gym. Go online with free Wi-Fi or watch a movie on DVD in the comfort of your room. After a long day of work or play, take a plunge in our heated indoor pool. Our hotel is pet friendly, and meeting space is available. Our Fort Leonard Wood hotel is the perfect choice for exploring natural scenic wonders of the area. Explore historic Route 66 or view the archeological wonders at Miller’s Cave. Expert underwater cave divers will want to experience Roubidoux Spring, where you can also fish and picnic. Experience scenic Pulaski County by floating leisurely along the Big Piney or Gasconde Rivers. Get a taste of local history at Old Stage Coach Stop Museum, just a few miles away, or sample the local vintage flavor at St. James Winery, about half an hour from our Ft. Leonard Wood hotel. Several popular restaurants, including Ruby Tuesday, Pizza Hut, Cracker Barrel and more, are located across the street from our hotel in St. Robert, MO. For a unique experience, dine in a real cave at the Cave Restaurant or indulge in hometown goodness at Miller’s Grill. Greek and German dining options are also nearby. Our Ft. Leonard Wood hotel offers a meeting room and full-service business center. 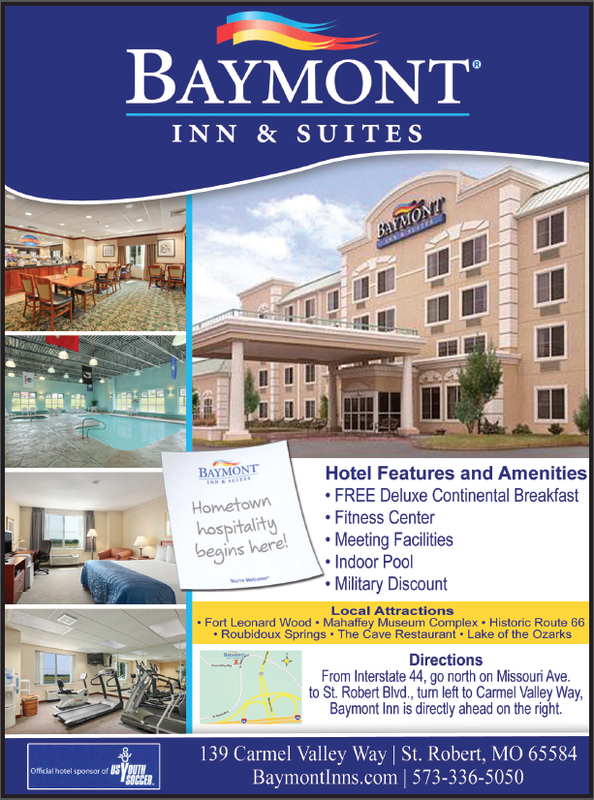 Baymont Inn & Suites advertisement in the upcoming Pulaski County, Missouri Visitors Guide.